Strong Salespeople vs Weak Salespeople.... Duh! Dave Kurlan has been on a tear lately. He's been digging into the data from almost 2 million evaluations to find the combinations that allow strong salespeople to succeed and cause weak salespeople to struggle. As you read this article, you may notice a shift in my focus. Dave's two most recent articles are Latest Data - Strong Salespeople Score 375% Better Than Weak Salespeople and Elite Salespeople are 200% Better in These 3 Sales Competencies. Both great articles, and not wrong, but they made me think about how I've spent the last decade. First, when I worked at Kurlan and Associates, I learned a recruiting process that Pete Caputa wound up using. Kurlan and other OMG partners have taught many recruiters how to use the process, but many don't fully trust the process and wind up hiring some weaker salespeople. I used the process to interview potential sales rock star candidates and screen weak salespeople away. Consequently, my clients did what it took to make the changes that were necessary. If you Google, "What is a sales coach? ", you will very likely see this article, but understand that the success of my clients was more selection of who had what it would take, than my awesomeness as a coach. Second, sales managers have tough choices. A while ago, a sales manager asked, "How do I decide which rep to work with?" When I asked for clarification, he told me that his top rep is typically at 2-300% of quota, so he's a huge chunk of the manager's quota. However, his newest rep probably won't close a tenth of what the top rep will this month. So, the ROI of time spent coaching the new rep is small. Exactly! The top rep is probably looking for a discount, special terms or something to 'throw in' to get an immediate sale. The new rep is looking to get better at sales, which may take a while. Two very different results with two very different payback periods. Furthermore, group training programs often have the same conflict. Look at this table. Notice that everybody in this group needs help in the first two areas. Theoretically, you would mandate the reps that need help in a particular area to attend, but in reality attendance doesn't always result in adoption. Consequently, the recommendation is often, "Don't hire them in the first place." 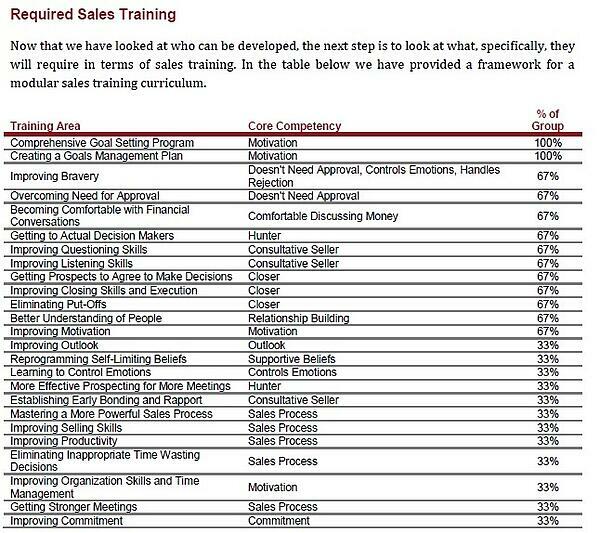 So, we wind up with 75% of all salespeople struggling or failing and everybody wants the top 25%. I wrote What Makes a Sales Rock Star Candidate? a few years ago. If you read the article(s), you may deduce that a middling salesperson may not have as clearly defined and personally meaningful goals as a top rep. They may not know what they could be capable of if they knew what to do and how to do it. They may not feel that a $12,000 investment in themselves would yield an appropriate return. Self image, self confidence and self reliance are very different when you're not working with a top rep, but patience and baby steps can help. August is upon us. Labor Day, the fall and year end are sure to follow. If you're a rep wondering what you're capable of and how to get there, or you're an owner that's wondering what your reps are capable of and you'd like to know before Labor Day, start here. BTW, I'm not suggesting that anyone should continue hiring weak salespeople. However, if you've already hired them, do you want to fire them without first trying to fix them?